To celebrate the release of HUGO on Blu-ray and DVD February 28, 2012. Here is a film clip and trailer. Renowned director Martin Scorsese’s groundbreaking and original adventure HUGO makes its highly-anticipated debut on Blu-ray 3D, Blu-ray and DVD, all with UltraViolet™, On Demand and for Digital Download on February 28, 2012 from Paramount Home Media Distribution. Recipient of more Academy Award nominations than any other film, HUGO was honored with 11 total—including Best Picture and Best Director—and has already won Martin Scorsese the Golden Globe for Best Director, was named the best film of 2011 by the National Board of Review, and was cited by more than 150 critics as one of the top 10 films of the year including writers for Associated Press, New York Times, Rolling Stone, Time, Entertainment Weekly, New Yorker, New York Daily News and The Hollywood Reporter, among others. Called “magical and enchanting” (Roger Ebert, Chicago Sun Times) and “one of the wonders of the world you need to see” (David Edelstein, New York Magazine), HUGO is bursting with dynamic action, sumptuous imagery and a heartwarming and magical story that audiences of all ages can enjoy. 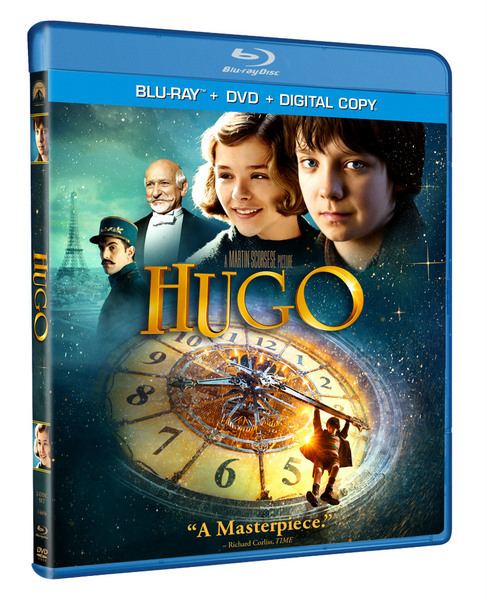 The HUGO Blu-ray 3D/Blu-ray/DVD combo pack includes all of the above, plus a Blu-ray 3D presented in 1080p high definition with English 7.1 DTS-HD Master Audio, French 5.1 Dolby Digital, Spanish 5.1 Dolby Digital, Portuguese 5.1 Dolby Digital and English Audio Description and English, English SDH, French, Spanish and Portuguese subtitles. The Blu-ray 3D includes the feature film presented in high definition and 3D. The single-disc DVD is presented in widescreen enhanced for 16:9 TVs with Dolby Digital English 5.1 Surround, French 5.1 Surround, Spanish 5.1 Surround and English Audio Description and English, French and Spanish subtitles. The disc includes the feature film in standard definition and Shoot The Moon (The Making of Hugo). Writer/Director Craig Brewer (“Hustle & Flow,” “Black Snake Moan”) delivers a new take of the beloved 1984 classic film, “Footloose.” Ren MacCormack (played by newcomer Kenny Wormald) is transplanted from Boston to the small southern town of Bomont where he experiences a heavy dose of culture shock. A few years prior, the community was rocked by a tragic accident that killed five teenagers after a night out and Bomont’s local councilmen and the beloved Reverend Shaw Moore (Dennis Quaid) responded by implementing ordinances that prohibit loud music and dancing. Not one to bow to the status quo, Ren challenges the ban, revitalizing the town and falling in love with the minister’s troubled daughter Ariel (Julianne Hough) in the process. Starring: Anton Yelchin, Felicity Jones, Jennifer Lawrence, Charlie Bewley, Alex Kingston, Oliver Muirhead, Chris Messina, Finola Hughes, Ben York Jones, & Jamie Thomas King. A love story is both a physical and emotional tale, one that can be deeply personal and heartbreaking for an audience to experience. Director Drake Doremus’ film Like Crazy beautifully illustrates how your first real love is as thrilling and blissful as it is devastating. When a British college student (Felicity Jones) falls for her American classmate (Anton Yelchin) they embark on a passionate and life-changing journey only to be separated when she violates the terms of her visa. Like Crazy explores how a couple faces the real challenges of being together and of being apart. Winner of the Grand Jury Prize for Best Picture at the 2011 Sundance Film Festival and of the Special Jury Prize for Best Actress for Felicity Jones, Like Crazy depicts both the hopefulness and the heartbreak of love. Long before he even met Shrek, the notorious fighter, lover and outlaw Puss in Boots becomes a hero when he sets off on an adventure with the tough and street smart Kitty Softpaws and the mastermind Humpty Dumpty to save his town. This is the true story of The Cat, The Myth, The Legend…The Boots. Academy Award® winner Charlize Theron plays Mavis Gary, a writer of teen literature who returns to her small hometown to relive her glory days and attempt to reclaim her happily married high school sweetheart (Patrick Wilson). When returning home proves more difficult than she thought, Mavis forms an unusual bond with a former classmate (Patton Oswalt) who hasn’t quite gotten over high school, either. The IMF is shut down when it’s implicated in a global terrorist bombing plot. Ghost Protocol is initiated and Ethan Hunt and his rogue new team must go undercover to clear their organization’s name. No help, no contact, off the grid. You have never seen a mission grittier and more intense than this. Paramount Pictures and Columbia Pictures Present “The Adventures of Tintin” directed by Steven Spielberg from a screenplay by Steven Moffat and Edgar Wright & Joe Cornish. Starring Jamie Bell (“Billy Elliot,” “Defiance”) as Tintin, the young reporter whose relentless pursuit of a good story thrusts him into a world of high adventure, and Daniel Craig (“Quantum of Solace,” “Defiance”) as the nefarious Red Rackham.